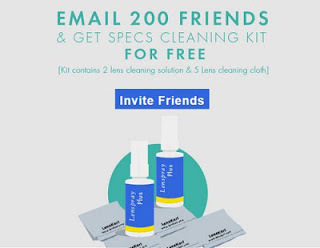 Get Specs Cleaning Kit Free From Lenskart Now you have to send email to 200 friends and after that you will get voucher of Lenskart through which you can purchase Specs cleaning kit for free. Now Invite atleast 200 of your friends. Once you sent invitation to Join Lenskart, Gift voucher code will be mailed to you. Two Lens Cleaning Solution & 5 Clothes will get added to cart. At Checkout Step 3 ‘Payment & Discount’ select E­Gift Voucher and apply the received voucher. Offer is valid only when 200 or more friends are referred. Offer will be applicable only when the referred email ids are unique. Only one voucher will be provided to referrer irrespective of no. of friends invited. Offer may vary from time to time based on Company’s discretion. All other Website Terms and Conditions apply.